In Part I of our series on presidential rhetoric we look at President Obama's Inaugural Address. Today we will look at John Adams', delivered in the city of Philadelphia on Saturday, March 4, 1797. As with the first speech, we will not be addressing the truthfulness of the assertions but rather we will consider primarily two questions: what is it trying to persuade us of and how does it do so. We will also, as before, look at some rhetorical criteria as set forth by Aristotle. Due to the complexity of some of the sentences I have chosen to annotate the sections. When it was first perceived, in early times, that no middle course for America remained between unlimited submission to a foreign legislature and a total independence of its claims, men of reflection were less apprehensive [of danger from the formidable power of fleets and armies they must determine to resist] [than from those contests and dissensions which would certainly arise concerning the forms of government to be instituted] over the whole and over the parts of this extensive country. Relying, however, on the purity of their intentions, the justice of their cause, and the integrity and intelligence of the people, under an overruling Providence which had so signally protected this country from the first, the representatives of this nation, then consisting of little more than half its present number, not only broke to pieces the chains which were forging and the rod of iron that was lifted up, but frankly cut asunder the ties which had bound them, and launched into an ocean of uncertainty. unlimited submission to a foreign legislature and total independence of its claims. The alternatives could not be any clearer. We have a clear, compact, opening sentence which paints a scene and situation for the audience to get drawn into. Adams continues by listing why the men were successful: they were, guided by pure motives, they had a just cause, they were wise people, they were under under God's watch. Yet he doesn't blandly list these traits, but rather breaks the parallelism of the third trait of the trio by using two words with a conjunction and alliteration (the i's.) Adams then adds yet another trait, here avoiding monotony with of a visual, "under an overruling." Also, notice the ascending significance of the traits that allowed these men to succeed: first their own qualities, then the qualities of the people who elected then, then God's watchfulness. 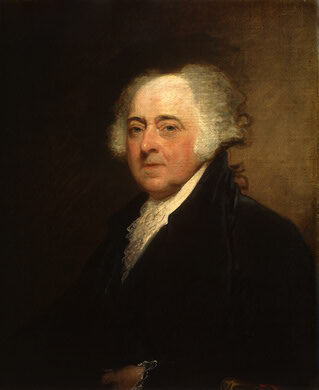 Adams continues, using the word "representatives" to emphasize the republican nature of the country, the slightly anachronistic word "nation" since technically there was no nation until after the declaration, and "growing population" to suggest subsequent prosperity. The second sentence has built from the descriptive literal opening and concludes in metaphor. not only broke to pieces the chains which were forging and the rod of iron that was lifted up, but frankly cut asunder the ties which had bound them, and launched into an ocean of uncertainty. Again, Adams' balanced clauses make the situation clear: the men broke A and B, cut C, and then launched into D. Notice also the tenses, the chains "were forging" and the iron "was [already] lifted up," suggesting that the men were only responding to actions that were already in progress against them. Note the use of "frankly" instead of the expected "also," an example of Adams using a stronger word wherever possible. Adams concludes with the classic and classical metaphor of risk and of statesmanship. Adams moves on to a more direct paragraph in which he simply, as a historian, recalls the first confederation which in three ways he characterizes as temporary, first insofar as it provided but the bare minimum of order that the people demanded, second insofar as it was written based on certain models simply because those models were the only complete ones, and lastly insofar as those countries for whom those models were written were quite different from America. For those reasons, it was inevitably temporary. 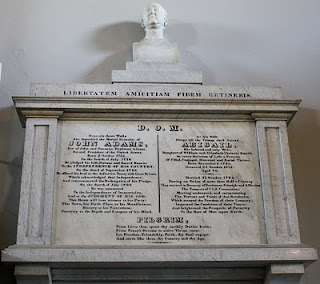 Adams is careful, though, not to offend the authors of those articles either, stating, "it was then certainly foreseen by some who assisted in Congress at the formation of it. . .," i.e. that they must have known it was temporary. Negligence of its regulations, inattention to its recommendations, if not disobedience to its authority, not only in individuals but in States, soon appeared with their melancholy consequences-- universal languor, jealousies and rivalries of States, decline of navigation and commerce, discouragement of necessary manufactures, universal fall in the value of lands and their produce, contempt of public and private faith, loss of consideration and credit with foreign nations, and at length in discontents, animosities, combinations, partial conventions, and insurrection, threatening some great national calamity. Adams continues with a list of the problems that occurred and while he is specific in describing the natures of the problems he refrains from listing any specifics. We will see that Adams tends to do this throughout the speech and at the end of our discussion will consider why and what he gains and loses in terms of impression and persuasion. He is careful to lay the problems at the feet of the imperfect confederation, not the people themselves, let alone anyone in particular. In contrast, he praises the people for their "usual good sense" for deciding to form another constitution. Adams quotes the preamble to the constitution verbatim and thus the thought of his speech flows seamlessly from the imperfect articles of confederation, through the strife which succeeded it, to the "more perfect union" of the day, ending with, "the present happy Constitution of Government." To set the stage, then, Adams traces the history of the nation from the revolution to the day of this speech in 1797. The thread most visible again and again that Americans of integrity and sound mind were who permitted success. Adams finally makes his own entrance in the narrative, deferring his entry further even into the middle of the sentence. He describes himself not merely as "working" or "living abroad" but as "employed" abroad, suggesting service. Adams uses in the next sentence another tripartite construction of parallel phrases with the verbs at the beginning of each, then breaking the parallelism by beginning the next sentence with "I": Irritated [by nothing], animated [by nothing], heated [by nothing], I read. . . Adams most cleverly does not stop this sentence but rolls right into his evaluation. Had he stopped he would have had introduce his evaluation separately and draw attention to the fact that he was judging everyone, a feature he acutely would seem monarchical. Instead he introduces his thoughts (which are an evaluation nonetheless) with a simile, "I read it as the result of good heads. . ." which bypasses his act of judging but not his judgment. Having softened its entry, Adams then offers more of his judgments, though still deferring himself to the middle of the sentence. 1) It was as comfortable as he had ever seen in the general and specific, 2) it was even as good as the state constitutions (an indirect, multi-pronged compliment), 3) he approved of it as a free man, and 4) he approved of it as a father. He approved of it in private and public. In contrast, he refrained from three things: hesitation to approve, object, or entertain the thought of changes. Only according to the will of the people themselves and the rules of the constitution itself could it be changed. Adams here echoes the Declaration of Independence's "in the Course of human events" with his "in the course of their experience." He is also careful of just who is doing what; it is ever the people who both "adopt" and "ordain" by means of their representatives. At this point we ought to make a note about style. The prose of the second president, a classically trained man and a lawyer, reveals his training and occupation. We see large-scale structures (Adams not only read Cicero and Demosthenes but often spoke of them) andspecific ideas (the lawyer must always make specific claims.) As a result we have organization with dense content. Returning to the bosom of my country after a painful separation from it for ten years, I had the honor to be elected to a station under the new order of things, and I have repeatedly laid myself under the most serious obligations to support the Constitution. The operation of it has equaled the most sanguine expectations of its friends, and from an habitual attention to it, satisfaction in its administration, and delight in its effects upon the peace, order, prosperity, and happiness of the nation I have acquired an habitual attachment to it and veneration for it. What other form of government, indeed, can so well deserve our esteem and love? and on the other he himself is persuaded by its goodness by the following reasons, from his 1) attention to it, 2) administration of it, and 3) the effects of it. For those reasons he "has acquired an attachment and veneration." That is, the government is sound in theory and sound in practice. "What more can you want?" Adams essentially concludes in a short sentence whose brevity (contrasting the previous sentences) drives home the argument. Nonetheless, Adams elaborates on this point more overtly in the following. Theory may be unpersuasive, he says, but the conduct of this government is surely testament to its righteousness. Adams is again most deliberate in his use of tense and voice: like that which has so often been seen. What has been seen is not simply something Adams saw and, if you don't like him, which you'd be inclined to disagree with. Rather, Adams suggests, "it has been seen" by many people. Adams is very subtly suggesting if not consensus a general observation. And what has been seen? Adams continues to summarize the essence of the government: representatives elected by the people at regular intervals to legislate for the general good. Adams again apostrophizes, essentially saying, "What can you add to this?" Whatever you might think it lacks, he says, those things are details. Surely you wouldn't prefer a king, who has his authority by accident, or a government so old it does not fit you? In a very clever turn of argument Adams says, "For it is the people only that are represented." which essentially challenges the listener by saying, in effect, "This is your government. You control it, so what could be the problem with that? If you don't like something you can change it." Adams chooses not to entertain any specific complaints about the constitution and government. We will discuss later the benefits and losses of this tactic. He continues to praise the people that they must in fact be very wise for such a government to have endured at all. That itself should be cause for praise and that is a legitimate cause for national pride. A very interesting paragraph of persuasion and argumentation by means almost exclusively of questioning. Adams concludes with a now familiar argument: neither A nor B is the case, but rather C, D, and E.
In the midst of these pleasing ideas we should be unfaithful to ourselves if we should ever lose sight of the danger to our liberties if anything partial or extraneous should infect the purity of our free, fair, virtuous, and independent elections. If an election is to be determined by a majority of a single vote, and [if] that can be procured by a party through artifice or corruption, [then] the Government may be the choice of a party for its own ends, not of the nation for the national good. If that solitary suffrage can be obtained by foreign nations by flattery or menaces, by fraud or violence, by terror, intrigue, or venality, [then] the Government may not be the choice of the American people, but of foreign nations. It may be foreign nations who govern us, and not we, the people, who govern ourselves; and candid men will acknowledge that in such cases choice would have little advantage to boast of over lot or chance. [Such is the amiable and interesting system of government (and such are some of the abuses to which it may be exposed) which the people of America have exhibited to the admiration and anxiety of the wise and virtuous of all nations for eight years] under the administration of a [A] citizen who, [B] [by a long course of great actions, [C] regulated by prudence, justice, temperance, and fortitude, [D] conducting a people inspired with the same virtues and animated with the same ardent patriotism and love of liberty to independence and peace, to [E] increasing wealth and unexampled prosperity,] has merited the gratitude of his fellow-citizens, commanded the highest praises of foreign nations, and secured immortal glory with posterity. This is probably not the best section of the speech, being rather long and wordy and without any particular unifying device. Here Adams' penchant for pairs of ideas starts to weigh the speech and the lack of larger-scale structure hampers the flow of ideas which is thus: government-people-nations-Washington-people-nations-posterity. It works, but not quite smoothly or readily. It is, in fact, a large, simple sentence and as such it feels weighted. The paragraph is clearly all about Washington but it ends with posterity and the argument and line of thought from government to posterity is not as clear as one would like, though the sense of Washington being the preserver of government for posterity remains. If you remove the asides and extraneous details, the awkwardness is apparent: a citizen. . . by a long course of actions. . . regulated by xyz, conducting a people. . . to increasing xyz. . . has merited, commanded, and secured. . .The distance between conducting and increasing makes one want to take them as parallel and independent when in fact increasing depends on conducting. The pairing is also awkward, "conducting to increasing." Lastly, do we take C to modify B or A? I think we ought to take B, C, and D as parallel and modifying A, though if so the conjunction "and" before D would have been most clarifying. Overall, the passage is comprehensible but slightly overburdened. In practice, though, with all eyes on Washington, with pauses for applause, and perhaps with gestures from Adams to both Washington and the people, this list of praises could have been more effective than it seems in print. In that retirement which is his voluntary choice may he long live to enjoy the delicious recollection of his services, the gratitude of mankind, (the happy fruits of them to himself and the world, which are daily increasing), and that splendid prospect of the future fortunes of this country which is opening from year to year. His name may be still a rampart, and the knowledge that he lives a bulwark, against all open or secret enemies of his country's peace. This example has been recommended to the imitation of his successors by both Houses of Congress and by the voice of the legislatures and the people throughout the nation. Though he concluded with "posterity" he was talking about Washington, who he returns to. Again, though, the previous sentence-paragraph is so big that the transition back to Washington feels like a jump. Adams emphasizes the voluntary nature of Washington's retirement before giving us another one of his lists. The fact that "fruits of them" is parallel to "recollection" and "gratitude" but refers to them and depends on them for sense, and that the list continues on to "prospect" which is parallel to them also, is slightly jarring. The next sentence is a rather bold (and complementary) assertion: so great is Washington that his mere name is a rampart and the fact that he lives is a bulwark against the nation's enemies. The phrase "recommended to the imitation of his successors" sounds perhaps awkward or in too grand of a style to the ears of non-Classicists. Today one would probably write, "recommended as a model to. . ." This is less an issue of style than grammar. The idea is nonetheless clear: everyone wants the subsequent presidents to be like Washington. Now this is quite a bit of prose, flowing nicely as it does from the previous thought. To paraphrase the thoughts, "Speaking as to what the President ought to be like, well, I should probably not say anything. But the occasion calls for something so I'll say this. . ." Adams continues with a massive anaphora through the repetitions of if. This is where Adams outlines himself and his principles for the people. The whole list, though is structured as an argument, and a simple one at that: "If all of these things will help me do the job, which is to serve you, then I'll take it." This list is, again, specific in idea but not in execution. This is essentially an oath which sums up the speech (about the virtues of the government, the people, and his predecessor), announces his hope for the future, and commits himself to the task. Adams concludes with a prayerful invocation for God's blessing, asking for order, justice, and continued protection. Overall we may say this speech is characterized by a great density of ideas. No one could accuse Adams of being vague. (Such specificity, as we said, is a lawyerly tendency.) Adams is ever precise and not afraid to use a parenthetical reference to avoid a misreading of his statement. There is a preponderance of pairs and trios of ideas and Adams clearly enjoys such pairings. Adams too took great pains to include all Americans in his praises and exclude no one from the events he depicted. He was careful not to name people or groups as responsible for the nation's problems. Certainly he was trying to bridge the growing divide he saw between the Republicans and Federalists, using Washington as the model and rallying point. He depicted the situation he came to as positive and put the burden of continued success on himself, the current congress, and the American people. He balances a commitment to the government and constitution itself and the more general principles of republicanism and democracy. He repeatedly emphasizes that the government and constitution is true to these principles. Adams is consistently humble, praising only the wisdom of the people, congress, and Washington. The speech is dense with ideas and especially dense with verbs, emphasizing action and energy, and modest with use of figurative language, which Adams employs sparingly but effectively. Its argumentation is careful and rather subtle, relying most often on his ability to paint a situation. Adams' lengthy opening, depicting the republic up to the moment of his speech, is quite effective. It draws everyone into the narrative and, by not excluding anyone, makes everyone feel as if they were part of it. As such, it puts everyone on a level playing field and invites all people to take part in the government and not retreat into parties or private life. Though the opening is in a rather learned style and the construction is complex, as a whole the speech is quite approachable. To consider again Aristotle's categories, we may say that the inaugural speech has two functions: for a president to outline his particular ideas and policy, and to celebrate America. Adams speech is a success as a ceremonial speech, praising the American people and government thoroughly and specifically. Aristotle also noted (Rhetoric I.ii) that three modes of persuasion exist: 1) of the personal character of the speaker, 2) putting the audience in a particular frame of mind, 3) proof or apparent proof of the words themselves. Which does this speech use? 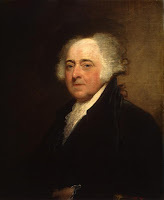 Adams utilizes Mode 1 two times, first suggesting that since he was abroad he was impartial and able wisely to reflect on the constitution and then at the end of the speech that his ideals qualify him for the post. 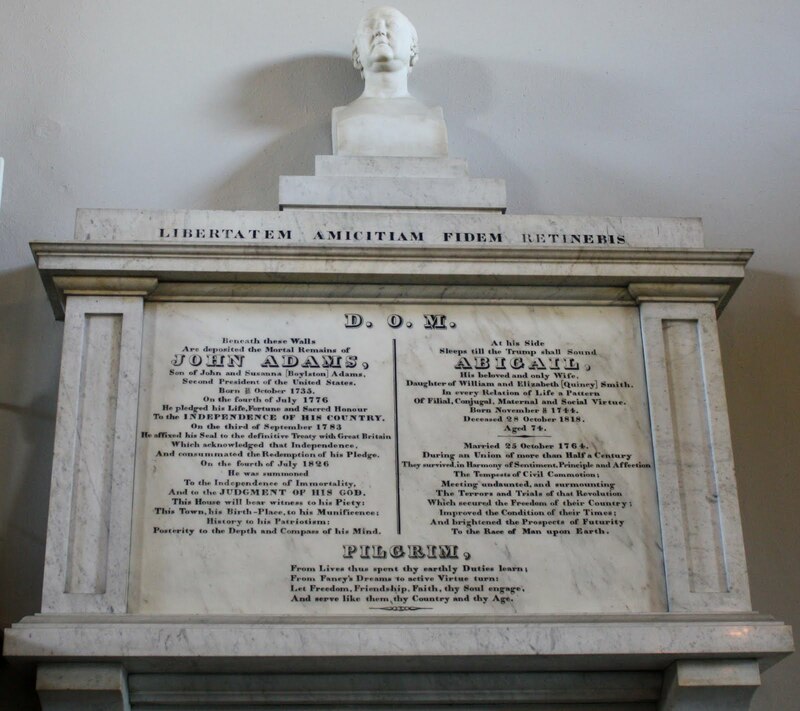 Adams begins with Mode 2, putting the audience in the frame of mind to approve of the government by painting its history and intertwining it with their own wisdom and the ideals of the revolution. The fundamental argument of the speech is that, "If the revolution was just, and you are wise, then the government is good," the argument which Adams makes most subtly in the paragraph of questions. Too, in his final paragraph, he outlines his goals (to maintain peace, to respect state's rights, et cetera.) Adams, then, avails himself of all three modes of persuasion. Adams recommends a course of action (faith participation in the current system) and praises the nation. Adams does not, though, make any specific recommendations in terms of implementation. The concluding large paragraph is not so much a statement of implementation as of principles. What does "a spirit of equity and humanity toward the aboriginal nations of America" mean in terms of action? What about, "an inclination to improve agriculture?" What does, "an attachment to the Constitution," mean in practice? Too, throughout the rest of the speech Adams talks more of ideas than specific events. He speaks of the "zeal and ardor" of the people but not of specific battles, he mentions that people are represented but not how (i.e., whether sufficiently), and he recalls the "universal languor, and jealousies and rivalries of States" without reference to specific events. These glosses and omissions miss opportunity for potency and vividness, though no doubt Adams made the concessions from a concern not to appear partisan. Unfortunately, when you do not address the alternatives to your policy you inevitably lose some of your ability to praise yours by making the alternatives appear unworkable, immoral, et cetera. Yet while we are not inclined to see controversial material in the speech we ought to recall that the government was still young and Adams inauguration was the first peaceful transition of power. It was not yet clear that the government would remain and many had doubts about its ability to. Thus Adams' course of action, avoiding potential controversy and emphasizing praise, is quite understandable and one could certainly argue appropriate or even necessary. The narrative is clear: set up, complemented, and most importantly, maintained by the structure. The structure of sentences and the attention to tense and voice are polished and effective. The speech is well-paced and the transitions from idea to idea are elegant. Adams is very effective at suggesting causality, e.g. "because these things are so, such must necessarily follow," and "if we avoid these things, then we will also avoid these." He makes the situation at the time of his speech seem the natural and positive outcome of past events. The whole speech is augmented by varied and vivid diction and careful attention to word order, though Adams' penchant for pairs and trios of words adds some length. There is always a mode of persuasion in use, that is, the speech is always rhetorical. Perhaps most of all, it is always engaging. Overall, a fine speech. In a recent conference between your humble co bloggers I commented that a lack of seriousness in one's character and purpose is not admirable. Likewise an overwhelmingly somber character is not particularly healthy or satisfying for one's friends either. No one looks forward to the presence of the dour fellow, no matter his brilliance, who drags down an evening's pleasant badinage with his dilemmas. The remaining question of course is how to balance the two and the apparent dichotomy has fascinated, or plagued, man for ages, from the time of Greek tragic and comic theater and the contrasting personalities of Heraclitus and Democritus (the "happy philosopher" and the sad) to Milton's poems L'Allegro and Il Penseroso, in which he characterized and contrasted the happy man with the thoughtful man. Of course different movements and cultures had their ideals too but two of them to me seem particularly wise, and similar. Indeed the idea of "good humor" was up until recently fairly common. A little farther back, John Adams was quite fond of the turn of phrase and the ideal of the man of good manners, sound judgment, and balanced disposition that it connoted. "When a young New England merchant named Elkanah Watson, the son of a friend, wrote to inquire what sort of manners he should cultivate in anticipation of touring Europe, Adams's answer went far to explain his own conduct under the circumstances and the kind of guidance he was giving his sons." Adams speaks of a balance, an "urbanity without ostentation" which seems most reasonable. The advice has a clear Roman sensibility, unsurprising given Adams' education and his knowledge of and respect for those ancient people. One ought to cultivate good sense and a manly simplicity, not let one's character be whittled down by activities which dissipate. Be serious, but do not offend with severity, be neither too easygoing or rude in sternness. Of course one ought to attend to his affairs and duties also. You'll be respected for when you abstain and when you retire from fun to attend to your private affairs you'll be well-thought of. Of course achieving this requires time and experience, but it also requires one to know himself and where to draw the limits on all things. To perfect such a disposition you ought to pull it all off in your own idiom and with a congenial charm. Simple, no? No, it's a life's work of conscious effort, but when you're done so you might just be an old gentleman. Just a brief reflection on thought that did not make it into yesterday's essay, "Man, State, and Morality." Some were barbarians for living under despots, others for living in tribes, but they were all not free. The Greeks lived in what we broadly and inaccurately call the city-state, what, Kitto writes, "became the focus of a man's moral, intellectual, aesthetic, social and practical life, developing and enriching these in a way in which no form of society had done before or has done since. Other forms of political society had been, as it were, static; the city-state was the means by which the Greek consciously strove to make the life both of the community and of the individual more excellent than it was before." The Gift of Men is death—the inheritance of Ilúvatar's Younger Children, which allows them to go beyond the confines of Arda, this world. Though the phrase commonly refers to this type of mortality, death is actually only part of the broader Gift given to Men: it is one with their ability to operate beyond the Music of the Ainur, which "is as fate to all things else". With this Gift, Men were to fulfill the world down to the finest detail. . . all other beings in Arda, including the Valar themselves, were bound to the World and its fate, [but] the Gift freed Men from this destiny, allowing them to shape their own lives as they wished. 1. In a recent essay at Big Hollywood Mark Tapson discussed and expressed disapproval with some recent statements by filmmaker Michael Moore, who asserted all Americans share in the immorality of what he alleged were crimes committed by the American government. This is in fact, and surprisingly, similar to a philosophically-centered conversation your humble bloggers had a few months ago. The question boils down to this: what exactly is the relationship of the individual to the state? The corollary point, which is the only one discussed most of the time, is where does the responsibility for state action lie? There are a number of issues at play here so let us systematically look at them using the United States as an example. N.B. While both of your bloggers discussed this issue recently, below are strictly my thoughts. I actually had in mind also various existential criticisms of the state, i.e. that it ought not to exist at all. Also, it is a rather preliminary investigation into these issues, presented here anyway for the purposes of promoting discussion and understanding of the questions. It is not quite what one would expect. Instead of "Life, Liberty, and the pursuit of Happiness" we have to "form a more perfect Union, establish Justice, insure domestic Tranquility, provide for the common defence, promote the general Welfare, and secure the Blessings of Liberty to ourselves and our Posterity." Logically we must assume the latter six not only to be compatible with but in fact a subset of the first three. These are those "principles. . . as to the people will seem most likely to effect their safety and happiness." Other principles we will find in the Bill of Rights and the form as we know will be a bicameral congress, judiciary, and executive. 4. But let us return to the notion of "consent of the governed." What if you withdraw your consent and refuse to be governed? You still possess the natural right to secure your "Life, Liberty, and Happiness" yourself. You would simply have a private piece of property somewhere not subject to the specific subset of laws adopted by other nations. We will call these "private men." This sounds acceptable, perhaps even preferable. However what if 10,000, or 100,000 such private individuals existed. Let us say they are free to interact with, amongst, and on the property of Americans. Should disputes arise, which law would prevail, that of the private men or the Americans? Each case involving a private man and an American would be one essentially of "international relations," i.e. highly complex. The only solution would be to say that on American territory American law prevails. This means American law is effective in certain places (still stipulating that Natural Law is effective everywhere.) What if, then, a man moves far away from American territory but still wishes to follow American law? Imagine the year is 1800 and 10,000 citizens from New York disperse to 10,000 private residences amongst the wilderness of the frontier and wish to follow American law. This is naturally impossible to carry out. They are effectively their own countries who choose to accept American law. 5. Let us look at another example. A child is born to an American family in an American city. This child as we keep saying has the same natural rights as all people. (We will not henceforth mention this.) Does he inherit the positive law also? Yet he is a child and subject to the laws of his parents too. Then let us assume he has reached the age of maturity, 18, and pose the same question. He would appear to have the choice of staying or leaving. If he leaves his choice is clear, but if he stays? May we assume consent? What if he inherits or purchases property surrounded by "American property?" Which prevails, his right to exercise his authority over his property or the concept that an umbrella of the state exists over certain property the state claims? It would seem the man's claim, being based on natural law, ought to prevail. 6. We see in the problems from the above section five that the concept of the state, which is by definition an entity of homogeneity, is in tension with the concept of liberal natural rights. The terminology of the preamble to the Constitution demonstrates the fact the Founding Fathers were attuned to this tension. For example, it mentions forming a "more perfect union" and insuring "domestic tranquility" and passing on liberty "to our posterity." All of these phrases suggest a need for smoothing over, for harmonizing, or at least mingling, discord. The first two phrases quite obviously refer to establishing the legal homogeneity required for a state we mentioned in section five above. The phrase "to our posterity" implies some need of continuity from one generation to the next. We will revisit these principles later. 7. We looked for the natural condition of man, shall we not do so for the state? Perhaps nature will resolve or assist us in resolving the contradictions we have observed. Undoubtedly the most famous statement in this line of observation is that of Aristotle's, from Book I of his Politics, that man "is by nature a political animal." The Philosopher reasons that the state is a natural outgrowth of the most fundamental association of all, that between man and woman. This pairing, he says, is not deliberate but natural and necessary. Such is the criterion he sets forth for associations, that "there must be a union of whose who cannot exist without each other." Clearly he is correct in this observation regarding man and woman. Can man exist without the state? Surely he may, theoretically, but can he in practice? Aristotle reasoned likewise that as man and woman form family, families form communities, and communities villages, and villages states. The end of a thing being its nature, man is thus said to be a political animal. Minimally we may say based on observation that lack of a state, even if such a lack is not natural, is certainly not the norm. Indeed, societies without continuous government and law can be seen to be less sophisticated. 8. A state comes into existence, as Aristotle says in the opening line of the Politics, with a view to some good. The Preamble to the American constitution sets forth the good hoped for. The legitimate state, then, exists to bring about for the people something necessary and something attainable by no other means. We should digress to elaborate on this notion. Namely that government should act only by design, toward its end, and not in incidental manner. Too it should not impede anything else which is necessary. Likewise it ought not to impede or promote anything contrary to its end. We see then, by this argument, that the protection of liberty, more specifically the restraining of criminals and of necessity the state itself, from violating the rights of citizens, is the only proper role of government because it is the only goal which can be carried out without destroying another. 9. To return to our earlier statement then, that the legitimate state exists to bring about for the people something necessary and something attainable by no other means. For example, the union of man and woman exists because without such a union humanity would not continue. Is the fundamental purpose of the American constitution, then, possible, without the state? It would seem so, especially because man is said to be "born free." If he is already free, then why does he need the state to be free? Yet is the preservation and continuation of liberty possible without a just (recall, "deriving their just powers") state? Clearly not, at least on one respect, for example the constitution was needed in the first place. The American colonists were free by right but not in practice. Likewise, "common protection" was deemed something only commensurate to a just state. This too is so, for while a man can defend himself from a bandit, and perhaps even a family may defend itself from bandits, it alone cannot protect itself from larger parties. This family is then both free and not free. Though seemingly free from compulsion, it lacks the means, the force, to deter those who would initiate violence against it and deprive its members of their rights. We see then that the role of government ought to be toward restraining those who would deprive others of their rights, i.e. criminals. Non-criminals do not need to be and ought not to be controlled. 10. Lastly we may address the issue of the "posterity" clause of the preamble, which addresses the aspect of time. In fact it addresses an aspect of freedom only a continuum of some kind can fulfill. This clause makes the whole document eschew the ephemeral. Holding generations as well as individuals at legal parity, this seemingly slight phrase prevents any law which would sacrifice the future for the benefit of the present. This posterity clause is redundant insofar as everyone has equal rights and thus the old and young have the same. It merely emphasizes that these rights must of necessity be delegated from the young to the old. It would seem that while man is "born free" his nature being a reasoning and political animal, that is by nature he may act beside inclination and must somehow interact with others, preserving his freedom is less plain a task. Thus to be free in practice man must either be alone or establish law and order. Unless, of course, all men are virtuous and in accord. 11. Thus policing is necessary, as is an institution for it, but is it a task only a state can fulfill? Let us consider domestic policing and foreign threats separately. Of policing it is clear individuals can rightfully defend themselves, and likewise clear delegating this authority to experts is desirable so one does not have to be in fear for his property or always to defend it himself. Yet it seems a private policing agency could be effective. In order to be in accordance with law it would have to work closely with the appropriate legal agency. It would then differ only slightly from a formal, state-run police force. However if there were multiple and changing forces the courts and legal system would be unable to coordinate with them all and produce a consistent protocol for dealing with crime. Such would also be a problem in having multiple, dynamic, private armies: they would all need to liaison with the appropriate federal agency in order properly and consistently to carry out national defense policy. Both situations, private police and armies, would produce too many variables for the legal system. Additionally, it being the case that the military and military operations have higher needs for unity it would be infeasible to merge or intermingle these private forces, potentially many and diverse in skill, age, and size, into a single operating force for imminent combat. As such the national force would be compromised. Also a military tradition must exist to maintain a sufficiently trained army, although should no other professional armed forces exist in foreign lands, one would then not be needed since all would be at equal advantage. Until then, one must exist in a state. Such of course presumes a standing army and thus a need for expediency. Only an in-place institution can react swiftly to dangers. Or at least more swiftly than if the citizenry had to react to each common danger as if it were the first. For example, imagine a citizenry being threatened by a foreign power. Now imagine if they had not just to decide how to defend themselves, but first if and what sort of body, and a body of which people, ought to be convened to decide. 12. Yet these arguments are relatively slight and might conceivably be overcome given sufficient communication, planning, and efficiency. Such not being universally attainable, the above arguments must be brought forth. Most importantly, though, the administration of law must be enforceable and enforced, and for this reason some element of force must stand behind the rulings of judges and arbiters. If private enforcement agencies were instituted, they would in theory be accountable to the legislative and administrative authorities, but in practice would pose risk of faction in the realms of interpretation, jurisdiction, and administration. Great caution must be applied in the creation of all institutions with the force to bind, since all force and power, external and internal, are potential threats to liberty. A great army to defend against external force might prove as great a threat to the citizenry as a foreign force. Precedent offers many such examples, most notably the Roman army's influence on the succession of the Caesars. . . .great caution would seem to be required. For the habit of lightly changing the laws is an evil, and, when the advantage is small, some errors both of lawgivers and rulers had better be left; the citizen will not gain so much by making the change as he will lose by the habit of disobedience. . . For the law has no power to command obedience except that of habit, which can only be given by time, so that a readiness to change from old to new laws enfeebles the power of the law. Second they must be instituted, i.e. carried out by an institution, i.e. a government entity, e.g. the mechanisms of administration or enforcement. Such is because all laws, even when they are fixed, are subject to the vicissitudes of life insofar as their administration, though not necessarily of their interpretation. Only an institution whose rulings are regarded as binding can create the objective standard needed for order. We must note, though, that an institution is not a guarantee of the end. We must stress it is itself only a means. Government does not guarantee liberty, of course, though good government is needed to create an orderly sphere in which liberty may be lived. Yet good government itself has requirements, namely broad understanding amongst the people of the nature of democratic-republican liberal government and the desire for, and the industry to create, peace, justice, and equality of rights. It also ought to reflect and be consistent with the natural law, its positive law ought to be practical to administrate, and it ought to reflect the nature of the people. An institution of good government is, though, a necessary means as mechanism and a natural, though not complete, retardant to change because it harbors precedent. 14. Having discerned the natural need for and state of the state, let us at last return to our issues from section five. The need for a state, in order to justify its existence, to exist fixed in time in law and domain means it cannot endure a constant flux where at any given time any amount of it is in fact not of it. In other words a state needs a domain. As such a man, though a non-American, can obtain and freely possess American land, the land must remain of American law. The law being of a fundamentally liberal, i.e. minimal, nature, this ought not seem so egregious. This also answers our question regarding citizenship, i.e. if an individual comes of age and remains in the land does he consent to its rules? If the land is inherently of the law, then yes. We must add, though, that he must be free to leave. 15. Having inquired into the fundamental natures of man and the state we can look at the more subtle aspects of their relationship. Foremost we observe that it is the preservation of liberty which naturally binds them. To stray from this end is to be destructive of it. To stray from this end is also a moral hazard, since the individual has consented to be governed only toward the end of protecting his own liberty, not toward any other. To pass laws irrelevant to this end is also a breach of the contract between the governor and governed. In such cases the fault lies with the governors and legislators. The terminology we just used, that "laws bind" should make us pause and recall that all laws bind. Thus laws in addition only to addressing the issue of liberty, should be as few as possible. Such demonstrates the necessity for the principle of federalism, wherein within one state there are smaller ones and still smaller ones. In a cascading effect, some laws apply to the whole land, some to smaller jurisdictions, and some only to the smallest. This has several benefits. First, people have choice amongst regional constitutions. Second, people are subjected to as few laws as possible, since people of a certain opinion can have their own town and law without trying to make a larger area, and thus likely people who disagree with them, subject to their law. Third and similarly, it is easier to pass certain laws since they will apply to fewer people and thus need a smaller consensus. Lastly, this system of cascading laws, or federalism, allows people to bind together for issues of great importance, and be free from what they do not wish to be a part of. 16. We see then that while life, liberty, and the pursuit of happiness naturally exist they do not naturally persist and are not always possible to act on. Even if one thinks freedom is conducive to allowing the individual to have everything he needs, it does not follow that everything (or nothing) is conducive toward effecting freedom. The Founders were acutely aware of forces, e.g. factions and mobs besides foreign threats, which were hostile to liberty. Even after experiencing tyranny, they resolved not to protect freedom by creating a vacuum of power, one they knew would be filled by the first man or confederacy which could arouse fear and promise security, but rather by arranging it as judiciously as it has ever been, with the most specific of focuses and limits. 17. We may now observe the last of our three aspects, that of the execution of the law. It is in this respect which citizens most differ amongst themselves, how to carry out the law. In a democratic society there are indeed a great variety of opinions as to what ought to be done, how, and when, even when the final end is the same. It is in these respects which the government acts contrary to the will of some of its constituents. This could only be avoided if 1) society was governed by an individual or group with absolute power, which would mean the citizens could not be blamed for the actions of the government because the citizens had no choice. Or 2) if the government only acted when 100% of the citizenry agreed, which would remove all agency of the government since such a time would effectively be never. 19. Of course this is not some easy and delightful solution. There is a certainly-apocryphal quote from George Washington that government is a “troublesome servant and a fearful master.” Indeed. Being political requires much of man. It requires diligence, reasoned consideration, and a consistent effort of keeping informed. Freedom too requires much of man, namely an active and continuous participation in government. Yet it requires still more than that, namely an understanding that politics both binds and separates, and that a man know himself, when to bind and when to stand alone. It requires a "conscious dignity becoming freemen." Such is the cost of a free society. Simply to resolve that the government is "just bad" and to exonerate yourself of its actions is as foolish and is as shameful an evasion as hyper-statism. It is likewise dishonest and false to claim a nation of democratic citizens at fault for each and every of its government's actions. These extreme approaches try to resolve a complex problem into facile answers, wherein problems are either the fault of everyone or no one. Letter to Joseph Cabell, Monticello, Feb. 2, 1816, M.E., XIV, 420. Koch, Adrienne. The Philosophy of Thomas Jefferson. Columbia University Press, New York. 1957. p. 154, footnote no. 19. Adams, John. Thoughts on Government. After completing this essay I revisited Ayn Rand's essay "The Purpose of Government" which I had last read several years ago. I immediately became aware of many similarities between this and my essay. These were not deliberate nor did I seek to emulate, build on, or critique Rand. Nonetheless I must acknowledge the similarities and the debt. Also after finishing my essay I read several sections of Ludwig von Mises' "Liberalism" and there too I noted similarities to this essay. Likewise they are not deliberate and in this case I had not read any of Mises' "Liberalism" prior to writing my essay. Lest for any reason this essay be thought to give license to statism or a loose reading of "freedom" or "liberty" please consider my essay, "A Libertarian Case for Free Healthcare?" The constitution protects persons, it's not limited to Americans. And persons is not even limited to good persons. It protects Americans, it protects aliens, it protects those legally here, it protects those illegally here, it protects those who wish us well and those who have caused us harm. It makes no distinction whatsoever. This is absolutely consistent, the constitutional protection of persons, with the Lockean, and Jeffersonian, and Augustinian, view, and Thomistic view, that our rights come from God and are gifts into our humanity, and are as much a part of us as the fingers on the ends of our hand. That would apply to me, to you, to George W. Bush, to Barack Obama, to Khalid Sheik Mohammad, to Richard Speck, to Al Capone, to anybody that the government wants to restrain for any reason. True law is in keeping with the dictates of both reason and of nature. It applies universally to everyone. It is unchanging and eternal. Its commands are summons to duty, and its prohibitions declare that nothing wrongful must be done. As far as good men are concerned, both its commands and its prohibitions are effective; though neither have any effect on men who are bad. To attempt to invalidate this law is sinful. Nor is it possible to repeal any part of it, much less to abolish it altogether. From its obligations neither Senate nor people can release us. And to explain or interpret it we need no one outside our own selves. This is the famous passage on natural rights from Book III of Cicero's "On the State" and it seems safe to say Cicero exceeds Judge Napolitano in eloquence. Even with Cicero, though, there is something daring about discussing the natural law, something audacious about declaring one rule for all everywhere. It's exhilarating too. Well this is something altogether unexpected. . . not only a declaration of our independence but of the rights of all men.
. . . to assume among the powers of the earth, the separate and equal station to which the Laws of Nature and of Nature's God entitle them. . .
We hold these truths to be self-evident, that all men are created equal, that they are endowed by their Creator with certain unalienable Rights, that among these are Life, Liberty and the pursuit of Happiness. That to secure these rights, Governments are instituted among Men, deriving their just powers from the consent of the governed. . . Individual rights are an individual's by nature. Period. The statement is boldly laid down as an axiom, not open to negotiation. This is not a dissertation on independence, but a declaration of it. These rights do not come down from kings or oligarchs or up from the majority, but reside in each individual. Indeed, and Napolitano also makes a key point: that the American Constitution only mentions individuals, not groups. It does not create distinctions and does not have different sets of rules for dealing with different "types" or "groups" of people. It can only deal with people in one way, as individuals. What a risk, not just to personal life, but of failure in establishing law and government of such a nature. For a mob to behead its tormentors is one thing and it is similar for a small oligarchy to change its puppet. History has many such examples and historians and philosophers have noted the tendency of governments to rotate amongst democracy, oligarchy, aristocracy, and monarchy. The forming of a constitutional democratic-republic formed by delegates elected from the people in order to replace a tyranny is not quite as common. While we of course benefit from their great sacrifices and challenges, we too continue to gain from what were at the time minute things: staying home to study and wading through Aristotle, Thucydides, and Edward Coke. No, posterity, you will never know how much it cost us to preserve your freedom. I hope that you will make a good use of it. If you do not, I shall repent in heaven that I ever took half the pains to preserve it. At the site where John Adams as buried, United First Parish Church, Quincy, MA. And serve like them, they Country and thy Age. Update: 2/17/13. I can't say I'm persuaded by this today. I leave it up for whatever instruction it may provide by its errors and whatever merits it possesses. I usually begin writing only after a great deal of reading. Regarding this essay, though, I consulted more or less only biographical and primary sources. As such I only came to a book that covers much the same ground as this essay when I turned to Google to verify a quote. As such I only came upon Gene Healy's 2008 book, "The Cult of the Presidency, Updated: America's Dangerous Devotion to Executive Power" after completing the overwhelming majority of this essay. Actually I discovered I had in fact bookmarked the link in my browser and that it had gotten overlooked amidst the other 500+ books in the "books to read" folder. Anyway, I have not read Healy's book though I will soon. Any similarities between his book and my essay are coincidental. Update: In another coincidence, today [June 2, 2010] the Mises Daily blog published Thomas E. Woods Jr.'s essay, "Theodore Roosevelt and the Modern Presidency" from the volume, "Reassessing the Presidency:The Rise of the Executive State and the Decline of Freedom," edited by John V. Denson. I was as unfamiliar with this volume as with Healey's when writing the essay posted yesterday [June 1, 2010], but I thought I would mention it here both to say so and because the work is relevant. Below is the fruit of your humble blogger's 2010 Memorial Day. It is a brief and cursory look, relative to the magnitude of the topic, at presidential authority. As I note in the introduction, it was spurred most immediately by the recent pan-punditry opinion that President Obama "fix" the oil mess in the Gulf of Mexico. More broadly, I had in mind in writing this essay how often people like to have it both ways with the president, wanting "Camelot" without the dangers of absolute authority. They want him to have agency, but only to bring about what they want. Likewise presidents seem to prefer authority without responsibility. This issue has of late been the subject of much popular attention but with surprisingly and frustratingly little substance. Such is most unfortunate. My hope is that this modest essay will promote some more scholarly and insightful yet still popular debate (i.e. debate not limited to academia) and that its cursory nature will be outweighed by the importance of the subjects brought out. In recent weeks the great and terrible oil spill in the Gulf of Mexico has rightly caused much anxiety in people everywhere. Of late, though, many Americans of various political persuasions have sought the solution from President Obama. Ought we to look to the Commander In Chief to solve this problem? Why or why not? Many look to him also expecting him to "fix" the economy. Is this a responsibility of the president? As the last president with his "I'm the decider" rhetoric, President Obama has since fostering the cult of personality that grew during his campaign, encouraged people looking specifically to him as the solution. His statement from his nomination victory speech in St. Paul in June 2008 epitomizes the manner in which the success was attached specifically to him. His election was the time, "when the rise of the oceans began to slow and our planet began to heal." While we must not get bogged down in the words of politicians stumping for office, considering they may say what they do simply to get elected, we should not disregard them outright on the grounds that they say what they expect will get them elected. If then-senator Obama thought such an approach would fail he doubtlessly would have proceeded with another. Thus the politician's approach says something about the politician's expectations of the people and the success of the approach confirms or denies the expectation. While this factor, the "popular factor" let us call it, is important, it is subject to variables that may cause people to act differently. To choose examples of late consider the wars in the Middle East and the economic crisis of 2008. Thus of the "popular" factor we have two subsets: the aspect of how citizens generally choose their leader and now they may whilst with extenuating circumstances. It would be fruitful to consider at length more conceptions of absolute monarchy and authority. Yet such an inquiry would indefinitely delay release of this essay which I hope to be timely and of imminent use. As such we must admit that our present investigation in part stands atop, however firmly, certain axioms of liberalism and republicanism, namely that individual freedom is innate and designing a state around freedom as a first principle is both possible and good. We may thus cautiously pass over the absolutist theories that stand wholly outside the American liberal tradition. (fortunately the fundamentals of these notions are familiar to most.) Yet it would be unwise fully to abandon them as the absolute monarch rose to fill a need in a society and the proponents of such a system of government sought to achieve some end by their plan. As such it might be fruitful to consider their ideas so the veritable need, if there is one, may be fulfilled by another means more amicable to our system, and that false needs, i.e. interests of select individuals or groups, might be guarded against. Since the ordering of society is not our present inquiry thus we must pass over it for now. Remember when we are looking into traditions essentially autocratic or monarchical in nature and not republican, we are only investigating the question of why someone thinks monarchy is necessary so we can discover those reasons, evaluate them, and then either disregard them or discover how to fulfill them in as democratic-republican a manner as possible. For example, Aristotle concludes that tyranny is the worst form of government thus the opposite of the worst is the best, thus monarchy is the best form of government. For our purposes, we may say that the characteristic of despotism by one man is the essence of tyranny, thus we ask "how do we avoid despotism?" (of both mobs and tyrants) without necessarily adopting monarchy. For a man is not a king unless he is sufficient to himself and excels his subjects in all things and such a man needs nothing further; therefore he will not look to his own interests but to those of his subjects.
. . . governments which have a regard to the common interest are constituted in accordance with strict principles of justice, and are therefore true forms; but those which a regard only the interest of the rulers are all defective and perverted forms, for they are despotic, whereas a state is a community of freemen. Thus the leader must possess all in excellence and safeguard the interests of the people. Aristotle has of course in mind particular interests for the people, as he is concerned with the good for the individual. We may consider that various constitutions necessitate various "interests." Now we said we would permit this excursion into thinkers and principles outside the American liberal tradition to learn what they thought only a strong monarch could accomplish. We have learned that the monarch must 1) fulfill the needs of the people and 2) that as a protection against corruption it is best for the monarch's needs to be the same as those of that public, that in seeking the former he achieves the latter anyway. Only such an individual, a king, we are told, can pursue the "common interest" without fear of corruption. Finding as best we can the positive aspects of monarchy being accomplished, we may now consider the negatives. This is a simple task and we need not dwell on the numerous flaws of monarchy, chiefly its degeneration into despotism with the pursuing of interests deleterious to the constitution of the people. But can the benefits of an executive be attained without the detriments? Who may govern free people? Thus we see what the government of The United States has been instituted for. How might an executive work towards this end? Because it would be foolish to consider the role of the political leader without any consideration as to the nature of the state he is leading, we should make a few observations. First, we must note the importance of the phrase "we the people." It contrasts the notion that sovereignty descends from the leader (i.e. the monarchial "sovereign") but rests in individuals. This cannot be stressed enough both for its legal implications and its social ones. In the latter case we must recall the degree to which the monarchical sovereign and his court was the center of life, wherein even private citizens related to each other by their relationship to the king. This is a system long-departed in America, with personal associations dominated by regional, social, familial, ideological, commercial, et cetera affiliations. Whatever the tendency of people is to gravitate toward a strong character, especially one who is perceived to embody certain values, be the figure political or not, this tendency must be seen as diminished today relative to its expression in the era of absolutism. It is not at all gone, though, and we see politicians ever and always hoping and trying to accrue and consolidate influence to compensate for their relatively weak formal authority. This fervor is usually confined to the office of the president and reaches its highest pitch around his election and inauguration, during which those disposed toward exuberance (irrational or otherwise) can rarely be persuaded the president is anything other than excellent. It is in fact a small subset who remain so enthralled outside this period. We are then looking at a leader of fundamentally different character and role, and with authority different in kind and degree. We will not make the claim that the American President is just a variation on the theme of the monarch. Having only just thrown off the shackles of tyranny, the authors of the constitution tread proceeded carefully in designing an "Executive." Yet one indeed, however weak, was deemed to be needed. The result of our inquiry into Aristotle and Hobbes taught us that "fulfilling the needs of the people" was one of the monarch's tasks. This of course implies authority and means. As we have said, the executive office will be limited. What should it's power be then? What individual sovereignty should the people delegate to the "Executive Branch?" We see that the task of providing for the people is taken from the monarch and given to the government as a whole. The "monarchical" branch is therefore now called "executive" in contrast to the "deliberative" branch of the legislative congress. The congress deliberates as to what ought to be done and legislates that it should be done and the executive branch carries it out, or executes the legislation. The branch is no longer the "rule of one" but the "carrying out." The next greatest issue regarding the executive office was this: what exactly is the president's authority to "carry things out?" The first manifestation of this questions is the President's veto (called "negative" by the delegates of the Convention) power. It was immediately contentions and none other than the esteemed James Wilson, legal scholar, signatory to the Declaration of Independence and The Constitution, and one of the first group of six Supreme Court Justices appointed by George Washington, along with Alexander Hamilton suggested that the executive should have an absolute veto, such being necessary to defend itself against the legislature and citing that the British monarch himself had seldom used it. This was roundly contested by three men on three grounds. First, Eldbridge Gerry of Massachusetts (one of only three delegates who in the end did not sign the final draft of this Constitution), thought no great control would be needed over the legislature which would naturally be comprised of the best men. Second, lawyer, Connecticut delegate ( and signatory to the Continental Association, the Declaration of Independence, the Articles of Confederation and the Constitution) Roger Sherman said no one man ought to be able "stop the will of the whole." Lastly, James Madison most practically suggested that "a proper proportion of each branch should be required to overrule the objection of the executive."
. . . The first man put at the helm will be a good one. Nobody knows what sort may come afterwards. The executive will be always increasing in size here, as elsewhere, till it ends in monarchy. Hamilton, in a speech on June 18, was more sanguine about "monarchy." It is worth quoting in its entirety. As to the executive, it seemed to be admitted that no good one could be established on republican principles. Was not this giving up the merits of the question, for can there be a good government without a good executive? The English model was the only good one on this subject. The hereditary interest of the king was so interwoven with that of the nation, and his personal emoluments so great, that he was both sufficiently independent and sufficiently controlled to answer the purpose of the institution at home. One of the weak sides of republics was their being liable to foreign influence and corruption. Men of little character acquiring great power become easily the tools of intermeddling neighbors. . .
First we see that the concept of a monarch or monarchial power exists to some extent within the American political tradition. This faith of the Federalists in the rule of the few or the one contrasts the Democratic-Republican faith in self-government. This famous split became personified in the clash between Hamilton and Jefferson during the 1790s, the latter accusing the Federalists of "monarchism" and designing to lessen the dependence of the Executive and of one branch of the Legislature on the people. . . so as to reduce the elective franchise to its minimum." In Jefferson's thinking, such a hierarchy would inherently gain power (an observation akin to Franklin's) and as such Hamilton and the Federalists' setup was inherently anti-republican and illiberal. (Not that he thought the executive should be powerless, certainly not after his tenure as Governor of Virginia, an executive office which had no veto authority.) Let us examine the specifics of Hamilton's suggestion that we may perhaps what he hopes to achieve through monarchy by means more amenable to liberal republicanism. Hamilton introduces two key features allegedly only the monarch can bring to government: insulation from foreign influence and stability. (Let us pass over his suggestion that one body of the legislature also be constituted for life.) Again we see as in Aristotle and Hobbes that the king ought to share in the interests of the people, and like Hobbes, Hamilton seems to think the monarch, at least the English one of not all monarchs inherently, shares most in the interests of the people. First let us examine the issue of whether the president might be more fit to conduct foreign policy matters .Now Hamilton was under the impression term limits would limit the president's ability to grow rich and thus make him susceptible to foreign bribes. Now this is reducible to a simpler one which is harder to answer: who is more likely to seek riches, who is already rich or who is poor? Can anyone definitively answer such a question without offering a subjective answer about the nature of man and a prognostication about what he is likely to do? There are examples of both the poor who seek riches and the rich who seek riches. We cannot even conclude with certainty that those who have riches sought riches. We may only conclude, with little use, that those who seek riches seek riches. Perhaps a compromise would be a post-service stipend for the president for the duration of his life. Is it the case that a monarch is less corruptible, by foreign or otherwise specialized interests, than a congressional body? This is contrary to Aristotle's claim that "the man are more incorruptible than the few as they are like the greater quantity of water which is less easily corrupted than a little." [Nichomachean Ethics, III.xv] Likewise we have Aristotle's claim that the individual may succumb to passions whereas the odds of a deliberative body of good men succumbing so are less. On the other hand surely we may see how certain members of a deliberative body could be bribed and their influence either corrupt others or generally stymie the efficient passing of good legislation. How is an executive less susceptible to foreign influence? First, he is under far greater scrutiny as the head of his branch. The whole nation scrutinizes him whereas congressional members tend only subject to the scrutiny of their constituents. (Even though sometimes they draw the attention they ought to, since they sit on committees with specific, national interests.) Second, the head of any institution by his excellence or at least his very singularity becomes most intimately associated with the most dear notions of the institution. Third, the prestige and remuneration of the post (during and after service) should outweigh any other potential attractions. As such the executive is indeed more suited toward conducting certain duties which should thus be delegated to him. Now in what manner would the interests of a republican "monarch" be tied to the will of the people? Absent autocratic authority, how would he? Perhaps again it is the feeling of the people that the leader embodies certain ideas. Perhaps it is the fact he is elected by the people, though the college of electors in fact makes the choice. If that is the case, making him leader for life would reduce his ties by eliminating his need to gain popular support and get re-elected. The system of term limits works well here, forcing the president both to gain popularity to get reelected but rendering him eventually ineligible. Now we may ask if the executive is inherently more stable. This virtue would again be diminished by term limits. With them, the executive is only more stable insofar as the legislature is constantly considering new legislation and the executive creates no legislation and only continues to carry out existing law. Also, less tangibly, the symbolic nature of the office is tied to unchangeable ideas. He argues then that these features would by compatible with and not at all detrimental to the essences of safety in "the republican sense:" due dependence on the people and due responsibility. To the first point he adds that a plurality of persons in the executive will A) impede expedience in emergencies, and B) obscure the truth in assigning blame to the executive (since if there are more than one they will blame each other.) This is a fine observation. The remaining three points are accurate in terms of kind, but one must examine them in the context of degree, i.e. how much of a duration, how much power, et cetera, which we have done elsewhere. He also adds, concurring with Jean-Louis de Lolme (1741-1804. Swiss political theorist, scholar, and proponent of British, constitutional, balanced government) that "the executive power is more easily confined when it is one." Is this so? This matter seems of a sort akin to ours about what sort of person seeks riches. We may only note the classic cycle of the changing of governments, that tyranny begets anarcho-democracy, which begets oligarchy, which begets tyranny. With these seemingly irreconcilable and cyclical forces we see the wisdom of the system as it came to be, its maxim being that: any vacuum of power will be filled and then overfilled, and thus it is best the one branch should balance the other, supplementing what the other lacks, and checking what it might have too much of. From what the executive branch ought to do we may also infer what it ought to refrain from. Most obviously it should refrain from interfering in the deliberations of the legislative body, which would give the executive power of both crafting and executing legislation. This must be avoided, though the executive must understand the legislation to know why or why not he ought to veto it. Such an upheaval would occur at every presidential election and thus the president should avoid this, encouraging continuity, whenever possible, in his department. Speaking of upheaval, we must consider term limits, which are in fact upsetting and not beneficial for stability. They prevent, though, the post of the executive, and its associated symbolism and prestige, from becoming tied to the person and not the ideas themselves. Also, limited term prevents power arrogating to him from throughout the executive branch. But, with term limits for the president and a congressional body that can also change have we not enough stability? By its nature, it reviewing law only for legality and not desirability (like the executive), it is the most stable branch and the one most conducive to a long tenure for its members. It is powerful yet limited by being highly focused. It achieves the stability the executive might and has under other constitutions, but without the dangers of degenerating into despotism by being of 1) focused and not broad power, 2) impartial, 3) with power diffused amongst several members, 4) slow moving, being primarily an appellate court which must inherently review errors of law or procedure, with such necessitating much scholarship, and 5) by being varied in composition "sometimes but not too frequently" as justices retire. Thus does the judiciary prove to be perhaps the most integral provider of stability and a most profound check on power. Thus we have inquired into some of the fundamental principles of a monarch and an executive administrator in a liberal republic. We have reviewed what the American executive was hoped to be and not be, and we have concluded as finitely as possible what it should be as a branch of a liberal constitutional republic. In the future we may discuss what when, how, and why it has differed. In a letter to Isaac H. Tiffany (August 26, 1816, M.E., XV, 65-66) Jefferson wrote of the tendency of the pure democracy, when it encounters difficulties, to revert to despotism, the people in "an abandonment of themselves to an aristocracy, or a tyranny independent of the people." Letter to Dupont de Nemours, Poplar Forest, April 24, 1816, M.E., XIV, 487-88. Letter to John F. Mercer, Esq., Washington, October 9, 1804, M.E., XI, 54. Madison evidently did not think this power and this participation in the making of laws to be an amalgamating of departments or inconsistent "with the theory of free constitution." See the notes on the constitutional convention for July 17, 19. It would be fruitful to review the debate on this issue, which can also be found in the constitutional convention notes for July 17, 19. 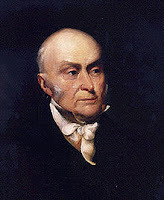 Adams, John Quincy. Memoirs. VI. McCullough, David. John Adams. Simon and Schuster. New York. 2001. Madison, James. [Record of] The Constitutional Convention. Malone, Dumas. Jefferson and the Rights of Man. Little, Brown and Company. Boston. 1951.